Riding PATCO for the first time? Welcome! Traveling between Center City Philadelphia and Southern New Jersey is easy, thanks to PATCO! More than 34,000 riders a day rely on PATCO to get to work, school, sporting events, cultural events, tourist destinations, shopping, and just about anywhere they need to go, without the hassles of driving. Since 1969, PATCO has provided fast, reliable transportation that connects riders to the region. With 13 stations to serve you, from Lindenwold, New Jersey through Center City Philadelphia, you'll easily get to where you need to go. Discover all PATCO has to offer! Find the station near you. 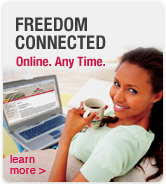 We'll deliver PATCO service advisories and news directly to your desktop or wireless device.